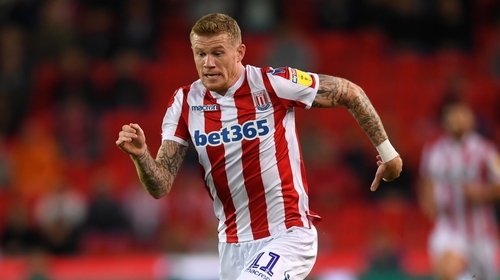 James McClean has apologised to the majority of Stoke City fans over his post on Instagram last weekend, saying they are "decent and respectful". In the post after last Saturday's match with Middlesborough, he criticised a section of Stoke supporters over their treatment of him. He said: "Your abuse, your throwing things, your booing, do your worst. To the home fans that are actually educated and support me, thank you." He added that "uneducated cavemen singing anti-Irish songs" will not change him and used a profanity in referring to the particular individuals. Stoke have today said their investigation into the post has concluded and "the player has been dealt with under the terms of the club's disciplinary procedure". The Republic of Ireland international has offered an apology to some of the Stoke supporters and referenced that he is "expected to tolerate" the actions of some fans. He issued the update on the Stoke City website. It read: "At last Saturday’s game a section of our supporters threatened and abused me because of my religious beliefs and upbringing. "I am certain that no fair-minded person would regard that as acceptable but I recognise that as a professional footballer, and therefore a role model, I’m expected to tolerate it. "Whilst, I do not believe it is appropriate for me to apologise to those fans who abused me, I do want to whole-heartedly apologise to the vast majority of Stoke City fans who although they may have different views to myself are decent and respectful.